Inseam- the hidden seam of a welted shoe holding together the welt, upper, lining and insole. Instep- top part of the arch of a foot over the metatarsal bones from back of the toes to the ankle. Also the corresponding part of a shoe last. Iron- term used for measuring the thickness of sole leather. One iron equals 1/48 in. (0.0283 in.). Three iron thickness is 1/16 in. and 12 iron is 1/4 in. Isocyante resins- Most application for this resin are based on its combination with polyols (e.g. polyesters, polythers, etc). During this reaction, the reactants are joined through the formation of the urethane linkage. Kid- originally referred to leathers made from the skins of immature goats, term is now used rather loosely to apply to glove and shoe leathers made from goat skins. Lap seam- the simplest form of seam used in sewing. Made by lapping one part slightly over the other and sewing through both. One or both of the parts so joined is usually skived along the edge to reduce the thickness. 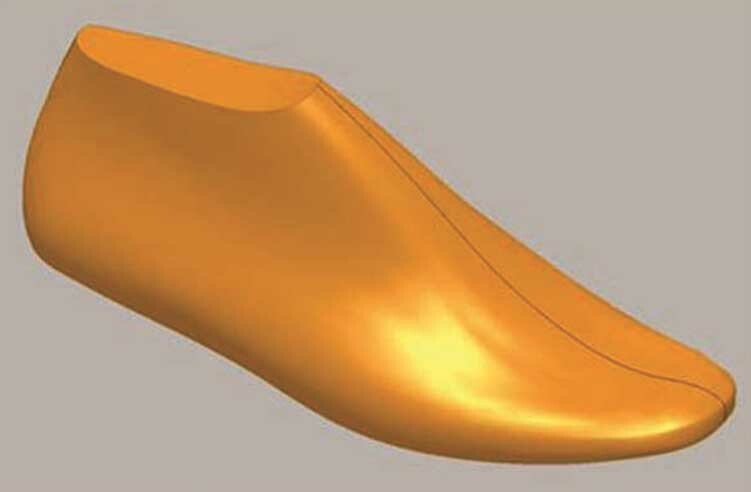 Last- form over which the shoe is made and which determines its shape. Although there are numerous types of lasts in common use, the basic differences are guided by the type of shoe construction. Lasts may be made of wood but are usually plastic. Lasting- one of the most important operations of shoe making. Requires the shaping of the upper tightly o\to each contour of the last, the pulling and stretching of the upper so that there will be no wrinkled outer or lining parts and no crooked seams. Lockstitch- a double thread stitch that locks the thread together within the material. It is distinguished in service by the fact that breaking one stitch does not permit the seam to be ravelled out. Louis heel- high heels with a gracefully curved back, with a lip extending part way under shank resulting in a curved breast. Usually 16/18 to 24/8 in height, sometimes called French heel.